Every producer who owns a parcel of the Chenevottes lieu-dit seems to produce something special. 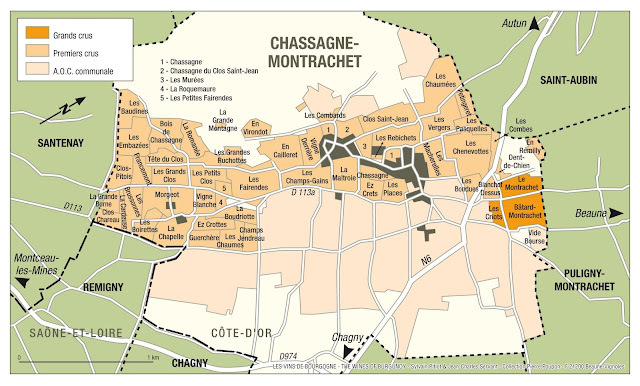 As the map shows, at one corner it almost abuts Le Montrachet. I consider it one of the most typical Chassagne premier cru in terms of terroir. There is always a pure, fruity peachy richness to it that one never finds in Puligny or Meursault. This Chenevottes 2017 delivers on that Chassagne typicity. There is white peach, apricot and crushed strawberry juice on the nose. Complimented by a touch of sweet marzipan and pistachio reminiscent of a Mozartkugel! The ripe and rich fruit continues on the palate. Impressive without being complex. At just over £40 pb in bond from Justerini & Brooks this is a very solid option to offer the boss and secure a pay rise.